Maine’s shame: Over 200,000 struggling daily including 1 in 5 children, 25 percent worse than the national average, and public policies making hunger worse. Visionary, grassroots and legislative solutions to be presented by dedicated Maine leaders, including Justin Alfond. Learn about the problem and the “solvers”: Public officials, master gardeners, business leaders, chefs, civic groups, college students, citizens, and other humane beings. 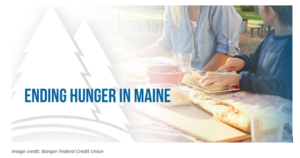 Union Church of Biddeford Pool will host a panel discussion on ending hunger in Maine, on Sunday, June 10, from 7:00 to 8:30 p.m. The panelists will be Justin Alfond, former President of Maine’s Senate and co-founder of Full Plates Full Potential, created to end child hunger in Maine; Frank Wertheim, an Associate Professor of Agriculture at University of Maine Cooperative Extension and committee chair of the Maine Hunger Dialogue, engaging college students and campuses to end hunger; and Holly Culloton, a Master Gardener/Volunteer who is co-leading the creation of Biddeford’s Mission Hill Community Garden. The moderator will be Rev. Jane Field, the Executive Director of Maine Council of Churches. All are welcome to this free event, at Union Church, 3 Stonecliff Rd, Biddeford Pool, 04006. For more information contact Paul Schlaver at: schlaver@maine.rr.com. Union Church is an interdenominational Christian church and self-described “evolving faith community” unionchurchme.com that focuses its mission outreach on helping to support Stone Soup Food Pantry, Saco Meals Program, Seeds of Hope Neighborhood Center, Ever After Mustang Rescue, The Samuel L. Cohen Center, and several immigration and refugee support organizations. “As a faith community, we feel a great responsibility not only to meet the needs of our brothers and sisters who are hungry and do not have access to affordable, healthy food, but also to ask the important questions about why this is still happening and how we might engage our wider community in a conversation about how to best bring about change,” Rev. Paula Norbert, Pastor of Union Church explained.